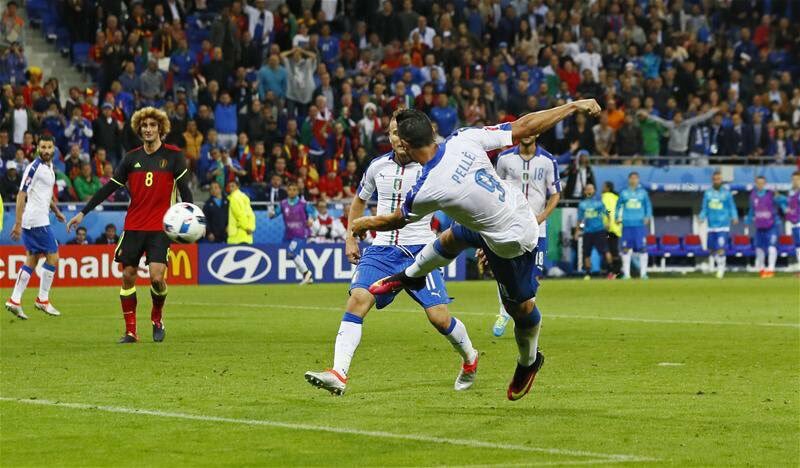 Graziano Pelle's late volley and Emanuele Giaccherini's cool finish helped Italy to see off Belgium in Lyon. A highly professional Italian performance outclassed a lacklustre Belgian side who will be devastated with the result. With the majority of the support in the stadium donning red jerseys, backing the Belgian Red Devils to kickstart their Euro 2016 tournament with a bang, Italy seemed to be pitted as the underdogs by pundits and experts alike. The two sides had met just 7 months earlier in a November friendly which saw Marc Wilmots' side comfortably win 3-1 in Brussels. When the group stage draw was made in December, this fixture stood out alone as the showcase contest in the opening phase of the tournament. Despite the scoreline, the game did not flatter to deceive in a tournament which has thus far been starved of goals. The expected pragmatic approach which we have become accustomed to from Italy did not occur, instead the 2012 finalists displayed fantastic energy and drive to dictate the early stages, limiting their opponents to the odd counter-attack. However, it was a rasping low strike from Roma midfielder Radja Nainggolan which Gianluigi Buffon had to deal with in the 12th minute. In particular, Premier League duo Eden Hazard and Marouane Fellaini were the catalysts for any attacking plans Belgium had, and the No.2 ranked side in the world began to find their rhythm. All that work went to waste, as a floated pass from centre-back Leonardo Bonucci found its way to Giaccherini who buried his finish past Courtois from 10 yards out. Suddenly, Italy were on the rampage and Antonio Candreva lashed a shot which was equally as well beaten away by Courtois, before a Graziano Pelle header rolled just wide as Belgium's defence lost their bearings temporarily. It seemed as though Belgium were lost and confused heading into half-time, Italy had put in a real shift for 45 minutes and deservingly led. Antonio Candreva and Matteo Darmian's lung-busting performances as wing-backs were testament to that. 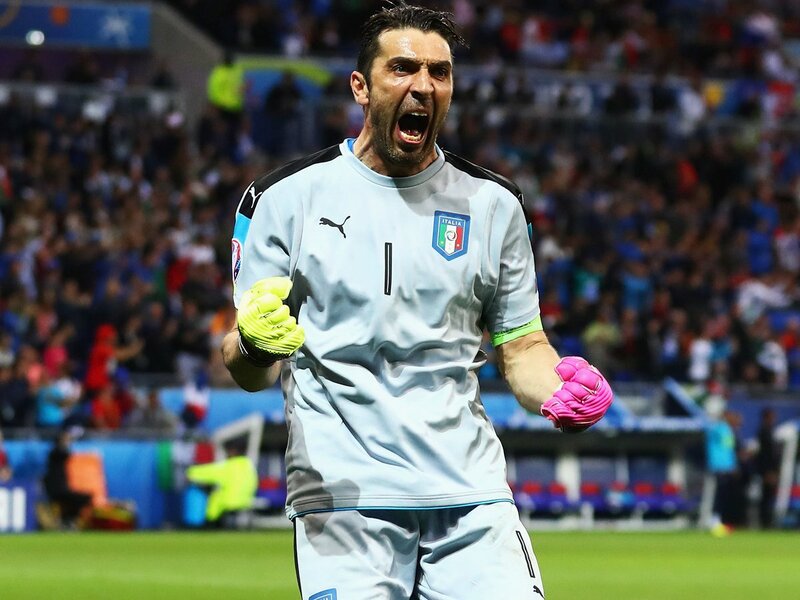 Gianluigi Buffon was instrumental in goal for the Azzurri. The age old adage of football being a game of two halves was certainly proved to be correct with a refreshed Belgium taking Italy to the sword early on in the second period. Kevin de Bruyne slipped a pass through for Romelu Lukaku, but the Everton man lacked the composure to outsmart Buffon. Moments later, Graziano Pelle was again frustrated by a flying save from Courtois to deny his powerful header. Sloppiness crept into Italy's game, and Belgium finally got a foothold in the game, dictating the pace and possession. Changes were made, Origi and Mertens thrown on by Wilmots, defensive marshall Thiago Motta came on to help see out the game for Italy. Origi was in the thick of it instantly, his header looped over the bar and his acrobatic effort failed as his team's chances faltered. Mertens then drilled a fiery ball across the danger zone, but Carrasco - also on as a substitute - was trapped by the Italian wall, unable to get a touch on the ball. It proved to be the last straw for the Red Devils, as Candreva raced away on the counter with the pressure ramped up at the other end, and his smart cross to find Graziano Pelle was met with a powerful volley to seal the victory with the last kick of the game. The Azzurri are off to a flyer with a highly respectable result, and could be waiting in the wings for a shot at the Henri Delaunay trophy itself on July 10 in Paris. As for Belgium, the defeat is a reality check for a team blessed with countless top-class individuals. The challenge is for Marc Wilmots to find a way to utilise their strengths on the pitch together.